Has anyone here used the Benelli oversized safety on a Nova? 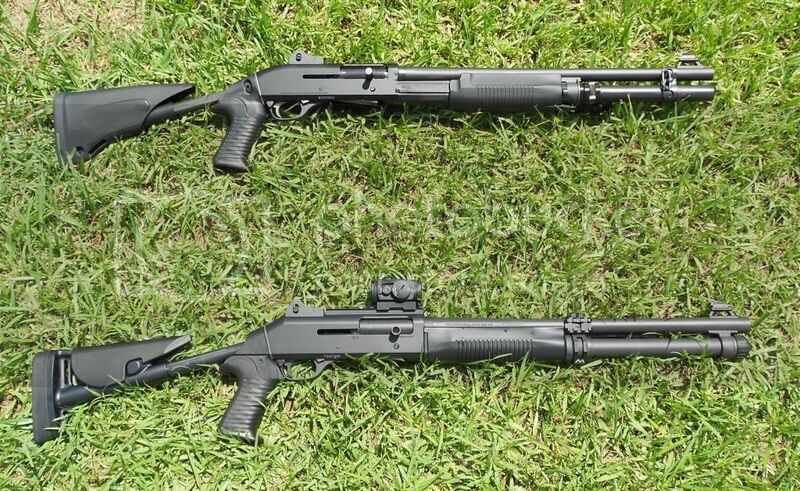 I've seen a few mentions of the Taran Tactical and Dave's Metal Works units on the M4, but no Benelli factory oversized safety reviews. Is is a worthwhile upgrade for the $30.00? It would be used on my HD shotgun. If you're the type that actually uses the safety, then it is a worthwhile upgrade. Being able to disengage the safety with your trigger finger without breaking your firing grip is a huge improvement. Basically you can feel the nub poking into your trigger finger if the safety is engaged. Pressing the safety inward with the inside of your trigger finger around the second knuckle is nice. Sometimes you have to modify the spring weight slightly to make it a little easier to press. They're all pretty similar in design, but I like the shape of the DMW a little better than the TTI one. The safety is kind of a PITA to change without the proper tools. The NOVA safety is in front of the trigger so you're not going to be able to disengage an oversized safety like you can the M2/M4, and others, while getting on the trigger. Regardless, an oversized safety will generally give you a more positive disengagement, especially under stress. Worthwhile? Probably. There used to be a thread here on reversing the safety but it's no longer accessible. As I recall, it's a bit more complicated to remove the safety than doing the M2/etc. I'm not even sure if the safety buttons on a NOVA are compatible with the M2/etc. Shows what I know about the Nova! Anyone with experience with the Benelli oversized safety? I installed an OEM extended safety on my M3; it makes disengaging effortless while not jutting out to Jupiter. The bolded part is exactly what I wanted to know. Thanks. That's an awesome pair of shotguns, too! I have the Benelli Oversize Safety on the way. If I'm successful installing it, I'll be sure to post my experience. Well, the Benelli Oversized Safety does not fit into the trigger guard of the Nova. It's a little too short. Hope this information is helpful to someone in the future. Can anyone confirm if this OEM safety will fit a M4? also is the safety button longer or is just the triangle part larger?